“It has been a real pleasure to work with Noted in Style and their team. We have already done a few projects with them and they have always been very friendly, responsive and professional and especially flexible in moments we had to deal with sudden changes. With an in-house team of knowledgeable sales advisors, creative designers and skilled craftsmen and women in production, Noted in Style are able to provide a swift and seamless, PERSONAL SERVICE from initial enquiry to receipt of goods. We all work with passion and integrity to create products and packaging with an UNRIVALLED ATTENTION TO DETAIL, ensuring your brand looks good and gets remembered. We’re TRUSTED to deliver by many of the world’s biggest brands – see who we work for and find out why they – and you – can trust us. Why use Noted in Style? Here at Noted in Style, creativity runs throughout our team. From sales staff who will advise you on the most suitable product and branding combinations for your requirements, to experienced graphic designers who can create artwork for you or recommend the best way to showcase your branding, through to our skilled production team that make your products. We achieve stunning results. We offer a range a range of customisation processes, including traditional methods such as hand debossing, foil printing, screen printing and engraving, through to more modern UV digital printing. With such a range of techniques we can ensure that we can meet any design criteria – whether classic corporate, glamorous and luxurious or bold, bright and contemporary. And of course, whatever technique you opt for, with our obsessive attention to detail you can be confident you’ll get the best results possible. We are specialists in the supply of premium stationery – notebooks, diaries, pens and associated items – including those from leading brands such as Moleskine, Leuchtturm1917, Parker, Castelli and Lamy. We’re also experts at designing and producing hand-made packaging, meaning we’re perfectly placed to create stunning corporate gift sets and event goody bags. 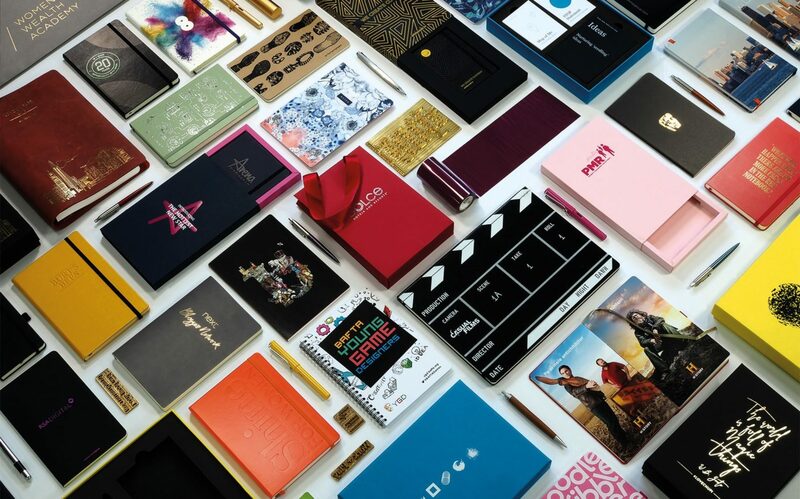 So whether you’re looking for a small batch of customised notebooks and pens for an executive meeting or thousands of branded gift sets for a worldwide product launch, we can help. And we understand that you often need things in a hurry, don’t worry, we’ve got your back, with many products available on fast turnaround. Perhaps you’re looking to source something unique or a little bit special? Our bespoke service is perfect for you – whether you’re seeking ultra-luxury or just a little bit wacky, we can generate concepts, design products and make them for you. We love a challenge here at Noted in Style, so why not put us to the test?